In the 19th century, the village of Oosterbeek attracted many painters, which gave it its nickname ‘the Dutch Barbizon’, after the famous French painters’ village. In September 1944, the idyllic village became the décor of one of the most dramatic battles in the Second World War: the Battle of Arnhem. Even today, the village shows the scars of this tragedy. Hotel Hartenstein, the headquarters of the British forces during Operation Market Garden, became the location of the Airborne Museum in 1978. At the Arnhem Oosterbeek War Cemetery, 1773 allied soldiers are buried. The Airborne Walk, which has been held annually since 1947, is the world’s largest one-day walking event. Every first Saturday of September, more than 30,000 people from the Netherlands and abroad participate in this memorial activity. 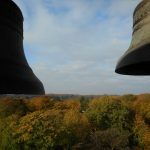 In Oosterbeek, memorial bells are also heard. 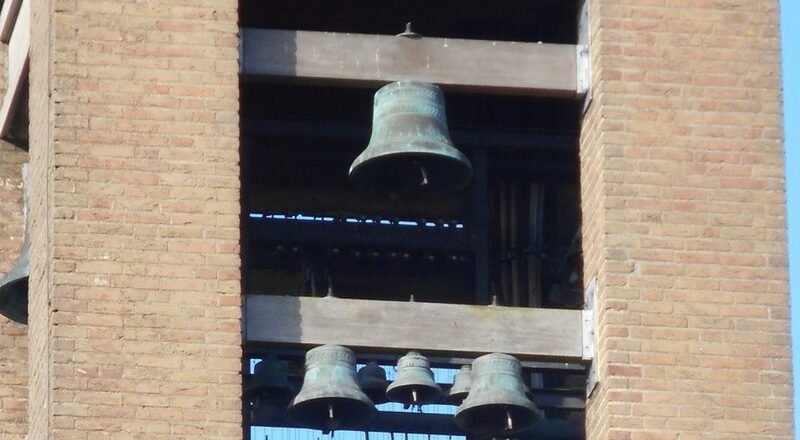 In 1965 a carillon committee started to raise funds for a carillon in the tower of the new town hall tower. 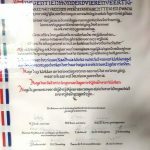 Funds were raised locally and from British military units that had fought in and around Oosterbeek during the Battle of Arnhem. 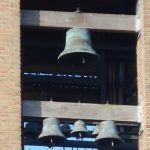 At the time of the opening of the town hall in 1966, only an automatic carillon of 25 bells could be dedicated. 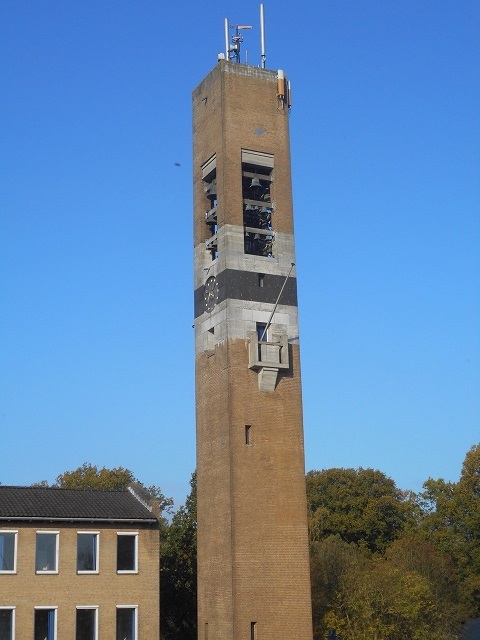 Nine bells bore the Pegasus logo of the British Airborne Forces, the name of the donating unit and the inscription ‘In memory of all ranks who fought in the cause of Freedom at the battle of Arnhem – September 1944’. 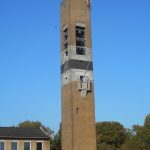 The committee continued its fundraising activities and on September 21, 1974, at the memorial ceremony commemorating the 30th anniversary of the Battle of Arnhem, a carillon of 37 bells with manual playing system was inaugurated. 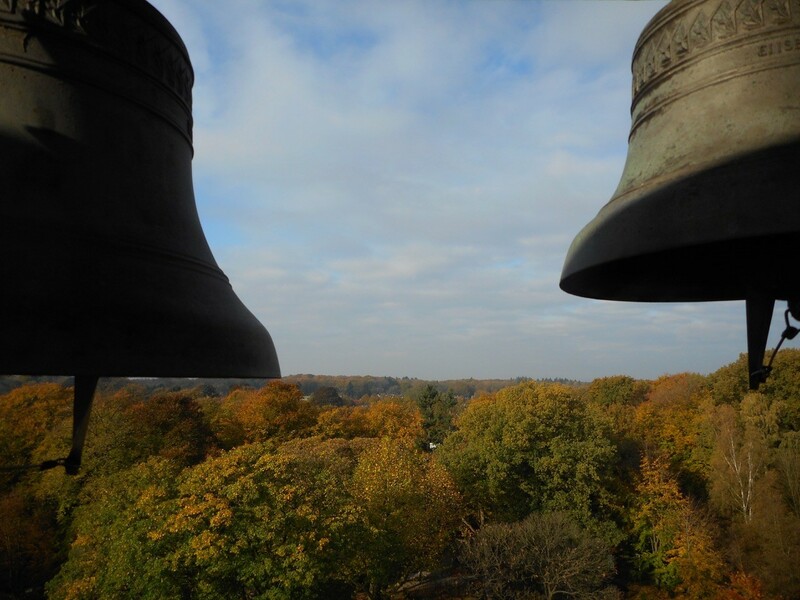 Since 2017 the memorial character of the carillon has been visually strengthened by a LED-lighting installation that displays the Airborne colors on the tower and in the carillon room. maar ook aan veel dat nieuw geworden is.